A drawstring backpack is quite an easy project, a good way to try your hands at working with technical materials and an useful item to have around, so I've made a couple, and plan to make a few other ones. After I took pictures I've found an improvement: adding more knots to the cords make it easier to adjust the strap lenght: I will add more pictures later as I will be able to take them. Fold the fabric in half on the long edge to find the middle, and put the webbing on the right side, centered on the fabric; open the fabric. Starting from the center of the webbing measure every 4 cm and sew it to the main body, backticking on each seam. 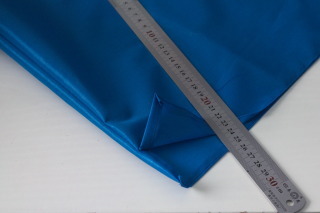 Fold the long sides towards the wrong side by 1 cm, sew 1-2 mm from the fold. 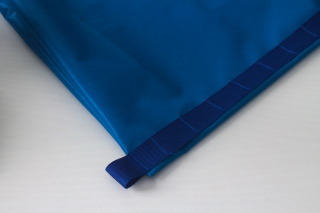 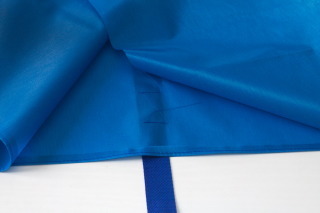 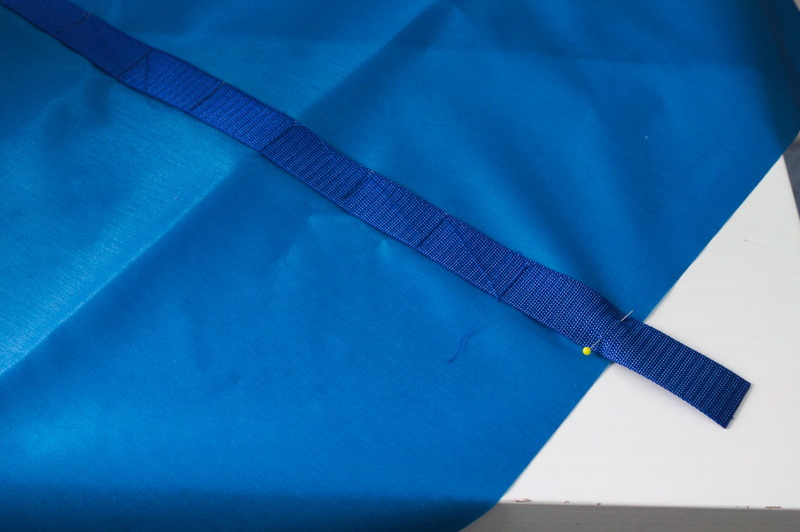 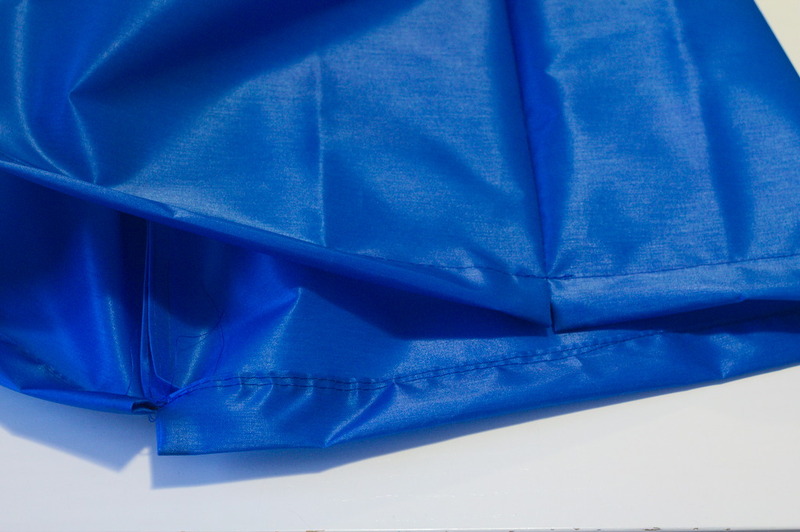 Place the right sides together, pulling the webbing so that its edge is aligned to the (just folded) edge of the fabric, sew the sides with 1 cm allowance, stopping 5 cm from the top; turn inside out. Sew and backtack on the webbing at about 1 mm from the border to stabilize the loop. 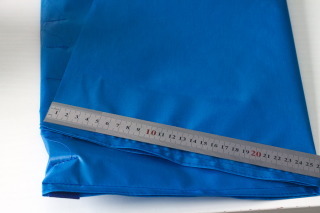 Fold down the top edges by 1 cm, sew again 1 mm from the edges. 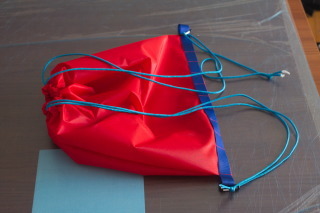 Fold down again 2.5 cm and sew to create a channel for the drawstrings, backticking near both side seams to add stability. 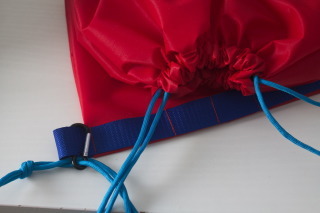 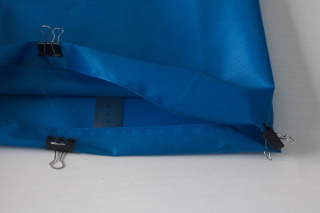 The channel will have two openings: insert the cords so that they exit from the opposite corners, make a knot at the bottom and attach them to the webbing loops with minibiners so that you can adjust the lenght.